The new PD52DCS is provided with a DC coil that eliminates the annoying buzzing during operation. 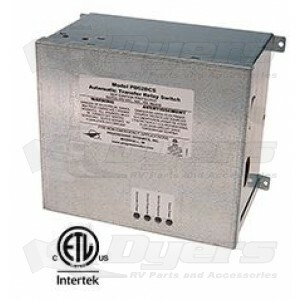 Now you can protect your expensive RV electronics from damaging power surges, open neutral and reverse polarity. The new PD52DCS is provided with a DC coil that eliminates the annoying buzzing during operation. The PD52DCS incorporates over voltage surge protection of 3300 Joules at 103,000 Amps — the highest in the industry! Features two green LED indicators that provide quick and easy indication of generator power or AC power availability. Two separate red LED indicators, when “ON”, display the need for service required for the shore power section, indicating there has been a destructive power surge! - When power is applied to the shore side, the contactor activates and supplies power to the panel—GREEN shore LED on front panel will light. - When power is applied to the Gen side there is a 20-45 second delay then the Gen side contact will activate, power will go to the panel from the Gen side and the shore side will be locked out—GREEN generator LED on front panel will light. - If shore power returns while the Gen power is present, nothing will happen. When the Gen power is removed the contactor will drop out and allow the shore side to supply power. - In a single leg application, the HOT1 side must be used for the control circuitry to work. For models with surge protection, both HOT1 and HOT2 must have power applied for proper operation. 240 VAC / 50 Amps. Rugged, heavy duty, screw type wiring terminals ready to wire to contactor base. Ensure ease of wiring and prevents wiring errors.